Market expectations about the pace of the US Federal Reserve’s quantitative easing (QE) have been erratic given the wide divergence of views in the FOMC and the mixed signals that the economic data has given. What is your assessment of how things stand at the road ahead, especially after the recent FOMC and ECB meetings? 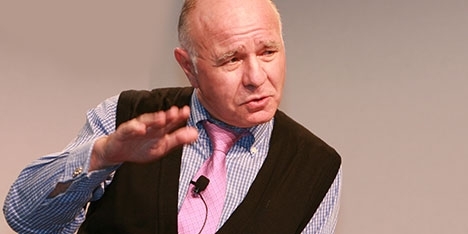 MARC FABER : Well, everybody has different views. However, in my opinion, I think that the US Federal Reserve has lost control over interest rates. If you look at the recent asset purchases of $85 billion a month, despite this asset purchases, the yield on the 10-year Treasury note has been rising now for more than a year. From 1.4%, it has now risen to 2.7%. So, we have a huge increase in interest rate already despite US Fed’s buying of treasury and mortgage-backed securities. So, I think it is not important to watch what the Federal Reserve is doing than actually watch what the markets are doing. Obviously, in the past, such interest rate increases have had a negative impact on asset markets.